Duraweld Industries, Inc. - LOCKS Many quality choices available! Standard Latch used when not installing a dead bolt lock. Lock and deadbolt sets available with Brass or Brushed Nickel finish. 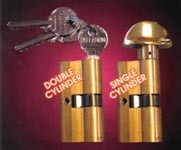 Lock and deadbolt sets are available with single cylinder or double cylinder. A steel frame is featured on the edge of our Slimline Lock series.